If you love buying holiday gifts at deep discount but hate dealing with Black Friday crowds, you’re not alone. According to an eBay Holiday Shopping Survey, 72 percent of shoppers start buying gifts early in order to find a better selection. However, 76 percent would still rather give something up—such as social media for a week (38 percent), sugar or carbs for a month (35 percent), or caffeine for seven days (32 percent)—than stand in line on one of the biggest shopping days of the year. One in four (26 percent) would even rather have a root canal than line up in the hopes of scoring a holiday bargain. Fortunately, eBay has the needs of frugal-minded convenience-seekers covered. The online marketplace is offering mega money-saving deals on thousands of gifts—and you don’t even have to wait until Black Friday to snap them up. “Every day, we always have thousands of deals available at ebay. And, we’re adding new deals every day, all with fast and free shipping on new items across tech, fashion, home, toys, and more, from top brands, like Apple, Adidas, KitchenAid, LG, and Samsung,” said Kiefer. Through November 20, many eBay sellers are offering an additional 20 percent off on purchases over $25. Just enter the coupon code PSHOPEARLY at checkout. You must use PayPal to receive this discount. Of course, the post-Thanksgiving holiday shopping frenzy doesn’t end on Black Friday. eBay shoppers can save money on gifts through November 27. Throughout the holiday weekend, eBay will continue to offer discounts at more than 30 to 60% off regular prices—with free shipping included. And thanks to eBay’s Price Match Guarantee, you’ll know you’re getting the best deal possible. While eBay may have started as an auction site for collectibles and used goods, it has evolved significantly since its founding in 1995. Today, the marketplace has more than 168 million active buyers worldwide, and 81 percent of the merchandise sold is brand new. 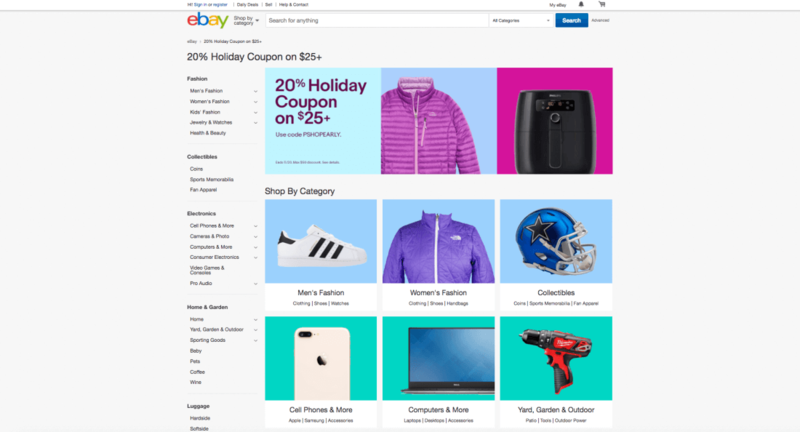 Bidding is no longer necessary on 88 percent of the products offered by eBay sellers, and 69 percent ship for free in the U.S.